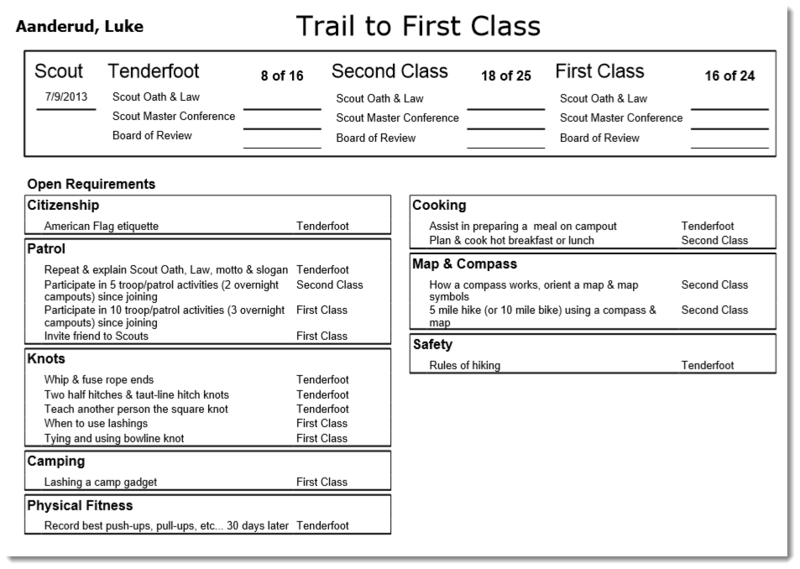 We are excited to rollout a new Trail to First Class report today. This report is a complete roadmap of what needs to be done to achieve the First Class rank. One the first page, we grouped the requirements into related categories to help leaders, parents and scouts quickly identify what it is they need to be working on. The second page contains the standard listing of all the requirements grouoed by rank. We also made the report available for email delivery via our Report Subscription page. 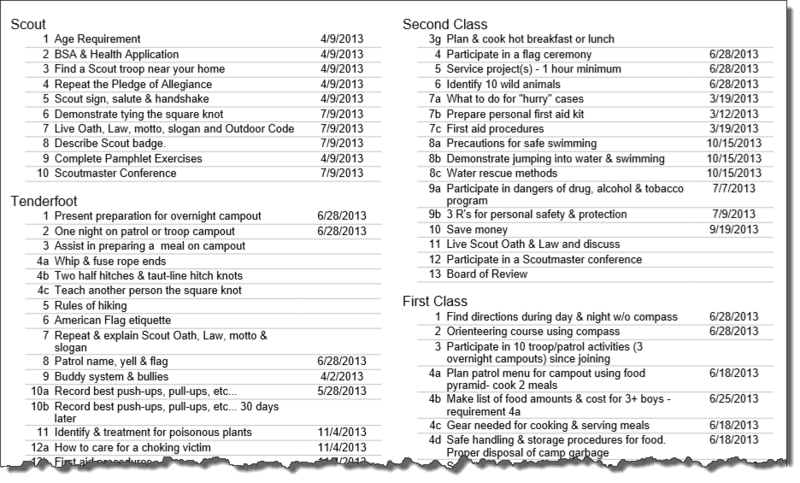 Schedule the report to be delivered to scouts and parents to encourage them to make consistant progress. 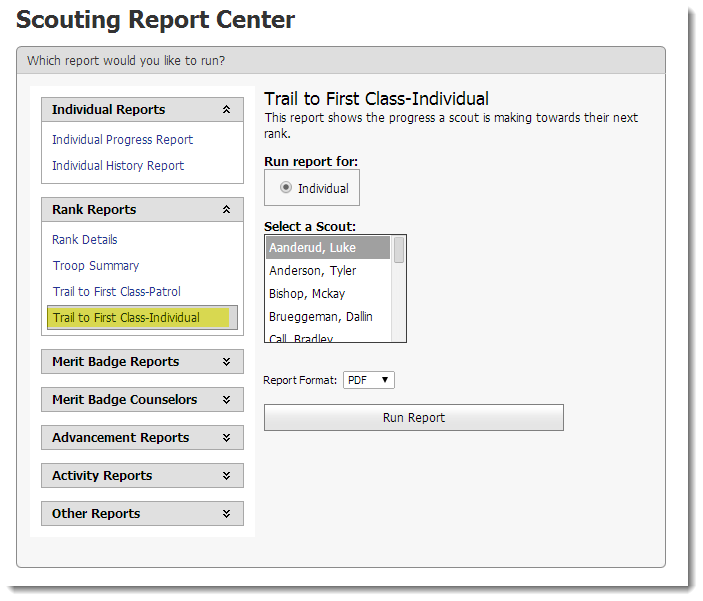 To access this feature, click on Reports and then Trail to First Class-Individual as shown below. Report Center that contains all of the availabe scouting reports. If you have ideas on how to improve the report, please let us know. This modified report is OUTSTANDING. I have had to combine parts of other reports to bring it all together for a snapshot; especially for the parents. THANK YOU! I understand that the “Cooking merit badge became required for the Eagle Scout rank starting on January 1, 2014”. and don’t see it on the Required Merit Badge Summary. Maybe you have the change in-work. Thanks again for the improvements!! Thanks for the kind words. We are glad you like the new report. As for the Cooking merit badge, we will have that ready by tomorrow. We will post an update here on our blog. I just noticed that the ” # of # “on the tenderfoot rank may be reversed on the new Trail to Eagle Individual report. On the attached I just pulled, it shows 18 of 16 requirements on the Tenderfoot rank completed. The other two ranks look ok.
We have fixed those issues for you. Please let us know if you need anything else.